Here are some bedroom painting ideas on color, health, styling, and wall decoration. And DIY-painting of course. Your bedroom is the room where you (or your kids) lay your head to rest, or share intimate moments, but also the room where you can be 'you'. Bedroom design is about a mixture of personal expression and serenity. Click here for bedroom painting ideas for teens, here for bedroom color schemes, and here for bedroom paints. What colors are good for your bedroom, depends a little on your personality type and your temperament. Are you a busy person, is relaxing not your natural incling? Or are you an easy-going, steady person, who'd like some decoration, stimulation etcetera. The bedroom is one of the most private places and you can use it for a bit of self-expression. But first of all, it needs to be a good place for sleeping. magenta's (shades of pink, skintones), help you relax. They relieve stress. Better not have them too strong though, that looks chemical (if they are too strong: add some green). Greens can keep you awake, but they're good if you're the soft and quiet type. It helps you resolve things. Heart-patients should avoid reds (and take blues instead), but people with low blood-pressure can be helped by it. Further down you'll find more on bedroom colors. Click here for more on color and mood. If you work night-shifts, very dark walls may help you sleep during the day. If you keep colors moderated and close to the wall colors, you can paint everything you like on the walls. Even just some stripes with a brush (and the right paint color) look great, once you've removed the masking tape, protective foil and put the furniture back in its place. For kids, the bedroom is great for playing. 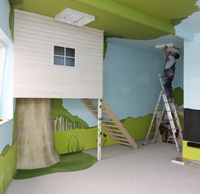 Kids often have a favorite color or scenery, and you can do them that special favor by creating their dream bedroom. Their own room might be like their own 'world'. You might think of favorite colors or decorations, but also a faux painted scenery might be nice, for creating a playing environment.Wall stickers can be very helpful too - check here for a selection of kids wall stickers. For teens, creating their own room can be an important issue in defining their identity and personality. Don't worry if they have wild ideas: just stay with it, and eventually apply some designing tools to the painting ideas they come up with. 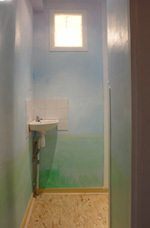 Click here for more ideas for painting teen bedrooms. Greens are said to be calming, and they are - but not for sleeping. They're good for getting a clear head. Unless you're the dreamy type, it's better not to have a green bedroom - no bright green anyway. 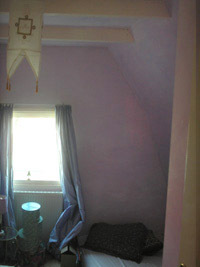 Magenta's, purples and skintones are better bedroom painting ideas. Blues can be good for a bedroom, even if only on the ceiling (a light clear sky-blue...), but you might want to add some warm colors for getting that protected feeling. And blueish violet might encourage you to keep on worrying, as it calls upon your feeling of responsibility. Magenta interior paint can look very 'chemical', you can help that by toning them (add bits of other colors: green, brown), to make them more natural. One notion on magenta's: they might stir up your inner life (which might cause some commotion after all). The combination of green and magenta is very nice as color accents for a white (or offwhite) bedroom. They give a balanced, clean and clear feeling. Use some toned down shades - greenish and pinkish. In their strong, chemical form, green and magenta contrast too strong. Strong reds make you active, especially the reds with orange in it. Orange and strong yellow itself is also something to be careful with, unless you're the easygoing type, or need some stimulation in the morning. 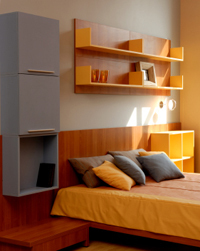 Bur orange and yellow in small amounts can give you a great mood, and add a feeling of sunshine to your bedroom. Bedrooms usually are not the biggest rooms, so shading is usually a good idea. It gives the eye a pleasing tonal range (variety in light and darkness) but doesn't cut up the room in sections of different colors. Smaller color variations give your mood something to ponder on and come to rest. If you choose purples to paint your room, note that small color differences make a big difference in this part of the color wheel. Always paint them in the light you're going to see them. Eventually, paint by daylight, with also the lamps on. Click here for more on color schemes. All in all, having toned down colors is important for a peaceful look. You might have to do some extra toning yourself. To do that, you add small amounts of the contrasting color to the color of your choice, to make it more pleasing to look at. You can also add small bits of color, to adjust your paint colors to your available daylight. When choosing paint colors for your bedroom, and making a design, note that your bedding colors make up a big visual surface. Eventual clothing closets do too. If you don't like them, consider painting them as well. Your bed should be sort of a celebrated place, as it protects your body while you sleep, every night. You can create this mood by doing something special to the wall behind the bed: an accent color, a faux finish, decorations, or a mural or wallpainting. Contrast is something that soon gets too much in a bedroom. You can use it sparsely, by putting brown and bluish grey together (the contrast will make them more lively, making the 'blueness' and the 'orangeness' come out), or by adding just a few dark elements in a light room. 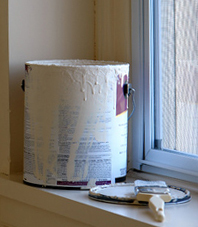 If you bought paint colors that contrast too strong, or don't fit to one another: put some paint from one can into the other (and vice versa), and they will look good together. A lot of bedroom furniture is laminated with a wood-look foil. You can't paint it as if it's wood, but if you want to change it's appearance: you can. Click here for tips on painting over laminate. 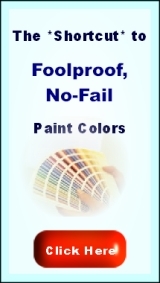 In terms of health, acrylic paints are less harmful than regular oil based paints, but still they are a pretty synthetic material. Toxicity is a big word, but there are very natural alternatives available. 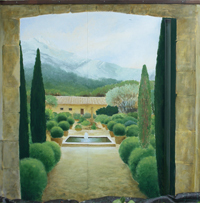 Click here for more on non-toxic paints and making egg tempera paint. Another advantage of milk- and eggpaint: they keep your wall breathing. 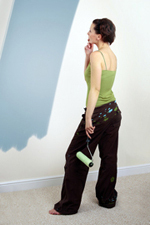 Your wall paint should breathe - Latex does that, especially the mattes and eggsheens. But in terms of toxicity, egg-tempera, plaster or loam are good options too. Also check this page on heat reflective paint, it can make a good contribution to your bedroom climate (and save on your energy bill). In case you spend a lot of time in your bedroom: a whole room in one color is like medicine - good for one, not good for another person. Let's take red as an example. Red is known to increase the speed of people's heart-beat when they're fully exposed to it- even when they're blind!. So, red bedroom walls are not a good idea for heartpatients. But people with low blood-pressure do great in red rooms. I don't know of other colors, being scientifically researched by others (too bad!). But I'd think yellow is a good medicine for depression, and green for people who can't wake up well. Blue, if applied well, might help you relax - or even, bring down your blood-pressure. 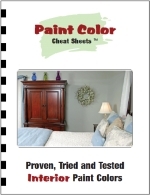 On the external links page, there's a link to a Feng Sui website, with more bedroom painting ideas on color and design. Give the bed a 'thank you', by giving it matching sheets, and an accent wall or mural behind it. Keep the computer out of the bedroom. Of course this is not a painting idea, but a computer can be a real jammer - literally as well as figuratively spoken.